Please, oh please tell me I'm not the only one. Paint, glue, glitter (*shudder*), play-doh, moon sand...they all make me twitch. I think it's because I am not at all creative, nor inventive, nor artsy. In the least. Eldest? Is kinda like me. Could care LESS about drawing, coloring, creating. He had to write a report on an animal, any animal, and then create a habitat for that creature. 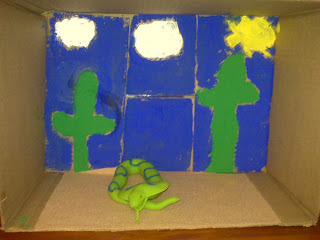 Then came the diorama part. The two of us shopped for supplies. I swear, it was like the blind leading the blind. Neither of us felt inspired to come up with a masterpiece, and frankly? I believe that CHILDREN SHOULD DO THEIR OWN WORK. I'm so not impressed by the parents who "help" their children with projects when it's obvious that the parents did, in fact, do ALL the work. Not my thang. Could it be any more lame?? Yes, the tan felt is "sand". Duh. But that's not all! Stay tuned for tomorrow when I discuss my contempt for school Valentine's Day cards and also how we cheated on what we did for Middle's 100-Days kindergarten project. Ha! Well at least you can tell what it is - a snake in his habitat. Score! I'm not crafty either. If I have time (har har) I like to try some things once in a very great while. But there is never enough time for me to enjoy trying to be crafty. PS - I miss you!! I think it looks great!!! I can totally relate. I'm not a crafty or creative person and dreaded when my girls had these types of projects. And I have to confess, I was secretly relieved when my youngest was out of elementary school and we didn't have do thost infernal Valentine's cards anymore. Oh and don't get me started on book orders! An hour of the kids making Valentine's for their teachers yesterday made me stabby. I dabble in crafts just enough to collect a ton of supplies and then never use them. I'm reasonably crafy, and I'm eyeing that diorama and thinking, "Looks good to me!" Because, like you, I think kids should do their own work, and that is clearly the work of a smart, straightforward-thinking kid. Good job raising that one. First, his diorama is great. Good for him for not turning in his mom's work. And second, I decided last night to junk my time-consuming crafty idea for school valentine's day cards and buy the boxed kind I had as a kid. Kids score points if you can tell what it is so in my book, that's an A+. My son's art projects usually involve black and no real chance at figuring it out. Well, I love crafts but I still have a soft spot in my heart for you. Agreed! I hate it when those types of home projects are assigned. Ridiculous. I am so not artsy or crafty. I get stressed my son has projects that involve these skills. Luckily, he enjoys making his own projects, without my help (I think he knows how they would turn out!). I bought store bought cards, and store bought candy for his valentine party. I'm totally non-crafty either. I see all these great crafts on the net, and think, wow, I wish I could do that. I'm SOOO not crafty but I start lots of crafts in hopes that it will just kick in one day! I will argue that you are creative and inventive, it is apparent just from your blog. You might not be crafty, but you are most definitely creative.